Are you wondering if there will be plenty of things to do in Glacier National Park with kids? 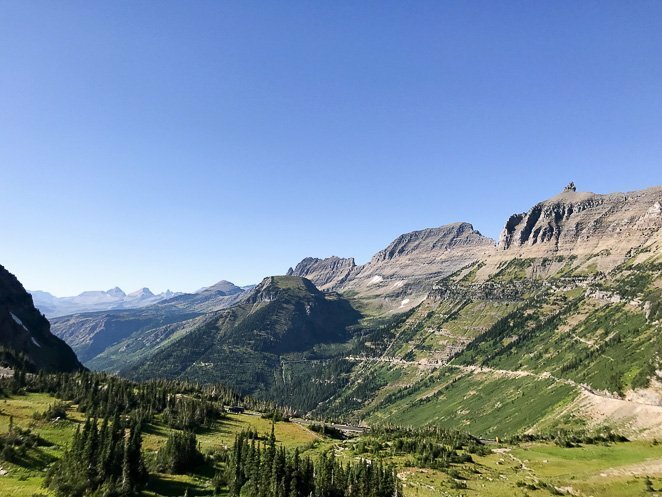 Did you finally plan the ultimate road trip with your kids out west and hope that you will ALL enjoy your time at Glacier? 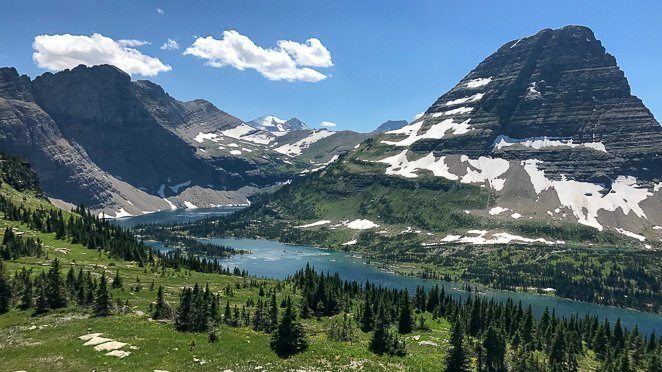 But first, what are some unique things to do in Glacier National Park, or better yet, the top things to do in Glacier National Park so that you can plan your trip out well? Our full-time traveling family spent 2 weeks in the beautiful park last summer and we were never bored. 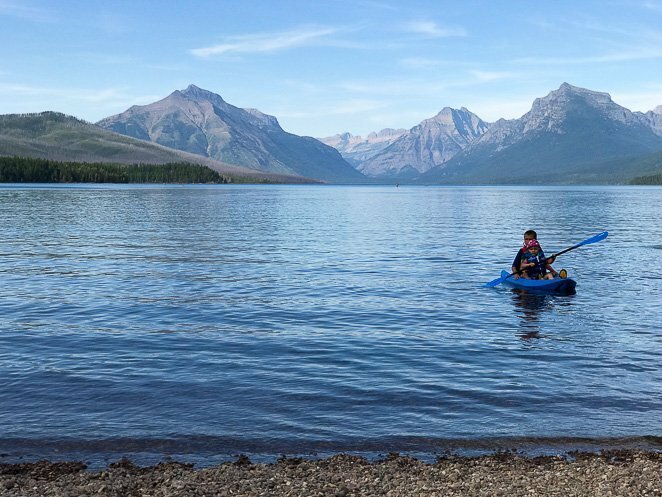 Read on to find our list of the many things to do in Glacier National Park with kids. 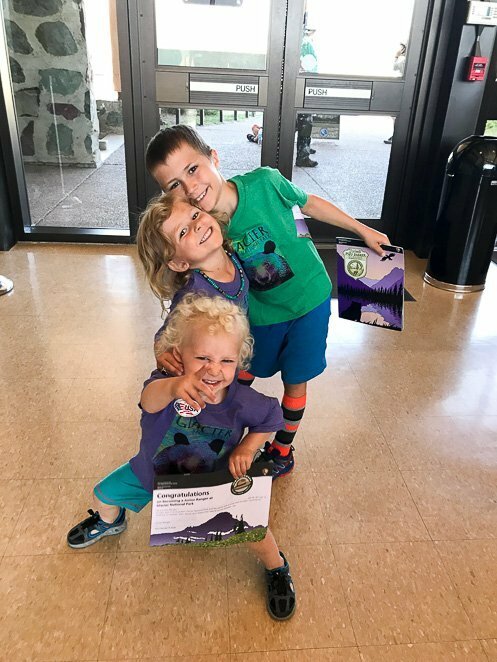 During the peak summer season, there are junior ranger programs provided weekly which are fun Glacier National park kids activities. We attended a ranger-led hike that met at the Apgar Nature Center and took our family along on a 1 mile hike. I learned just as much as the kids did and it was great to hike in a group with other families and children! Bure to bring your bear spray, water, snacks and have good hiking shoes for the whole family. The junior ranger program in Glacier National Park is free to participate in. Anyone can pick up junior ranger booklets from any visitor center and complete them during their visit. Many kids get pretty excited about these booklets, while others not as much. But if this is your first time visiting a National Park, give it a try! The kids then turn the booklets back into any ranger to receive a junior ranger badge! Many children proudly wear their junior ranger vest or hat with the badges that they've earned from other National Parks while hiking around the park. So be forewarned that you may want to buy a vest or hat at the gift store in any visitor center! If you like going on family bike rides, you’ll be happy to know that there is a paved bike path in Glacier National Park! Our family always enjoys finding paved bike trails and decided it give it a try. The paved path in Glacier NP connects Apgar campground to the Apgar Visitor center, Apgar Village and then to the Park Headquarters. If you are willing to take your family on the road for 1/8 of a mile you can then bike over the bridge into West Glacier. Be sure to bring your bear spray and have an adult lead the children on the bike trail. You cycle through the dense forest and the rangers warn you to be aware of many animals in Glacier National Park. Bears are the largest concern. I would list biking on my list of one of the top 10 things to do in Glacier National Park. You cannot plan a Glacier National Park family vacation without taking the going to the sun highway. 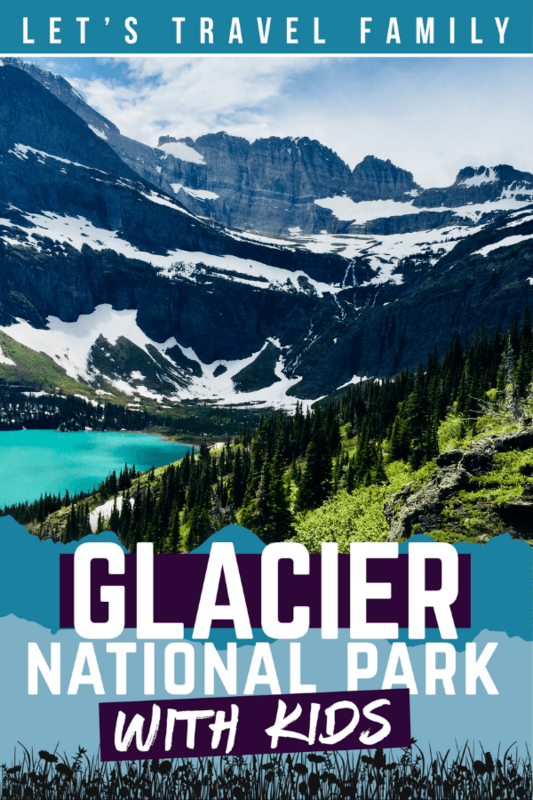 This famous Glacier National park drive will take you most of a full day so be sure to pack a lunch and plenty of water before you hit the road as a family! Be prepared to take many stops and get out to see the beautiful views! If you stop near Logan pass keep an eye out for mountain goats. 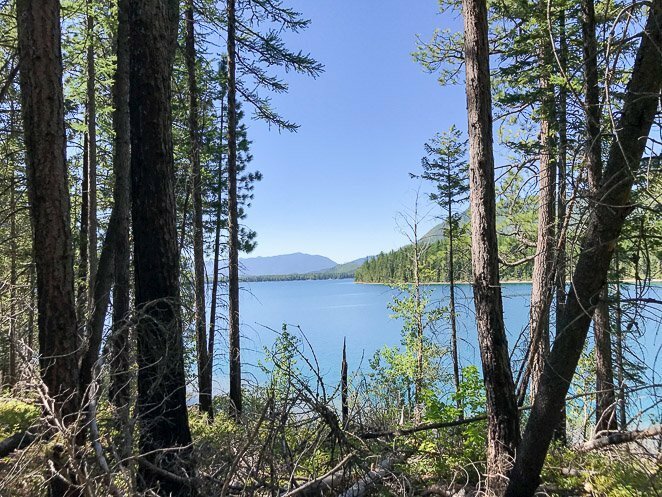 The drive from Apgar Village to St Mary’s and back can take several hours or more, so be sure to prepare the children with car activities and plan to pull off the road to the sun to take a few small hikes around. We broke our day up by stopping at the visitor center at St. Mary’s to watch the park video and turn in our junior ranger booklets. We also took some very short walks, the kids called them hikes, at a few pull offs. Glacier National Park going to the sun road is only open during the summer months, as you are up very high in elevation and they get a lot of snow. So be sure to plan your trip around the season so that you can experience one of the best things to do at Glacier National Park. Also, be prepared for a lot of congestion, especially at Logan Pass. They offer shuttles so that you don’t have to drive, however I suggest taking your own vehicle if you are planning to visit Glacier National Park with kids. We took the shuttle the first day and had to wait 1 ½ hours to get on a shuttle. Then get off at a transit stop and wait in line again for the next shuttle that only can carry 15 passengers due to the narrow road up ahead. As a family of 6 that involved us almost filling up half of a shuttle! Overall, it took us the entire morning before we made it up to Logan Pass Visitor Center. The parking lot was completely full by lunchtime at Logan Pass in July when we visited. Therefore, if we did it all over again we would wake up very early and drive our own vehicle to Logan Pass Visitor Center and park for the day. Keep in mind that Logan Pass is the half-way point on the highway to the sun road. The Hidden Lake Trail was by far one of the best hikes in Glacier National Park to do with or without kids! You leave from the Logan Pass Visitor Center and hike up into the mountains. We hiked this trail just after Logan Pass opened a few weeks earlier in July. The biggest excitement for the kids was finding snow and ice on the trail!! Be sure to have the children, and adults, use hiking gear and wear closed hiking shoes that can get wet. Or they will have cold feet in their Keen’s sandals like my daughter did! You are almost guaranteed to see mountain goats along this trail and a lot of sunshine. The Hidden Lakes Trail does not have any shade, so sunhats are highly recommended for the whole family. Even if the temperature is cool, you can still get sunburn! 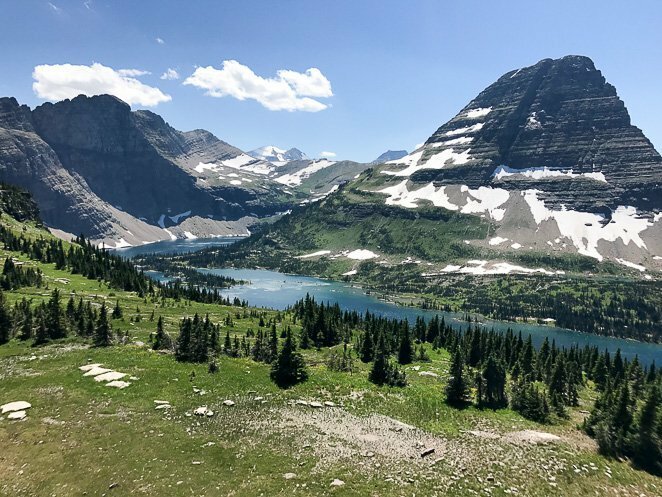 The view of Hidden Lake when you reach the top is spectacular and makes it one of our family's top picks for the best things to see in Glacier National Park. Apgar campground, in my opinion, is the best campground in Glacier National Park. The location makes it our top pick. 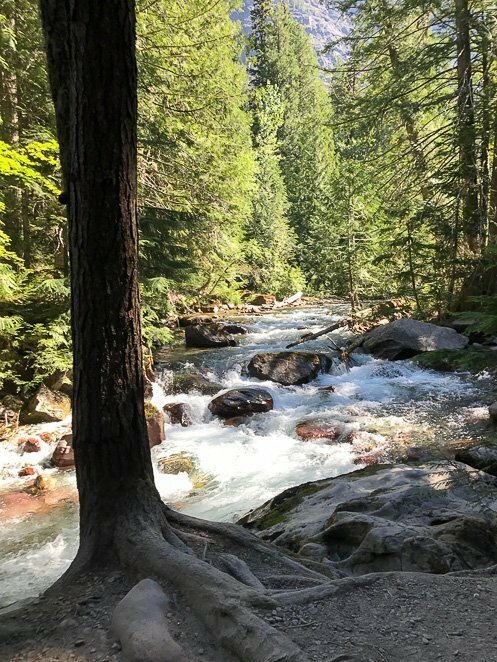 Camping is one of the best things to do in Glacier National Park but finding an available campsite can be a bit difficult. Apgar campground is just inside the park from the west giving the easiest access to the Park from the nearest town and airport. It's also within walking distance to Apgar Village and the Apgar Visitor center and shuttle bus stop. Not to mention walking distance to the beaches on Lake McDonald. Apgar campground also is large enough to fit most RVs. So it was a great find for our family's RV. We stayed for one night in Apgar campground, which is a first-come-first-serve campground. It fills every day during the summer, so be prepared to show up at 7am to drive around to find a spot. I would recommend coming during a weekday, you might have a little better luck then on the weekend for your arrival. There are bathrooms with flush toilets, but no showers. So, RV camping in Glacier National Park might be a great option. That way you have access to a shower! There are a few gift shops and restaurants in Apgar Village, with a few offering ice cream and espresso at their outside windows. If you’ve read my post about the Best of the Tetons you’ll know how much my husband and I enjoy a great espresso. Paddle board and kayaking can be such a fun family experience! 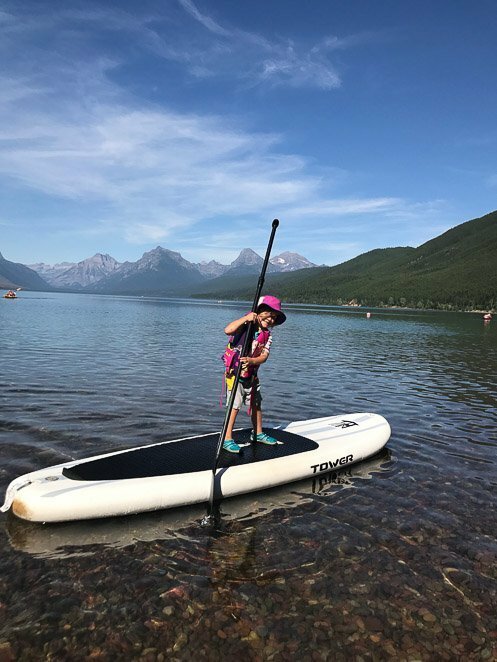 With the convenient rental company’s right in Apgar village, you can plan to try standing up on a paddle board on Lake McDonald. We even found that one of the rental company’s rents out child-sized kayaks! The kids were thrilled and we had to come back to do kayaking and paddle boarding a second and third time during our two weeks in Glacier National park! There are many pull-off areas to park along the beginning of the Going to the Sun road from Apgar Village up to Logan Pass. Find an available one and pull off. That’s what we did to find our own private beach! The water was crystal clear and the scenery was breathtaking! Just remember, bring your bear spray….and some snacks and water because your kids will not want to leave. Rafting in Glacier National Park is a pretty popular event. I was surprised to see so many families do it! There are many tour companies that work out of West Glacier, MO on the Flathead river. Many of the rafting company’s welcome children on the rafting tours, depending on the flow of the river. In May and June with all the runoff from the mountains, the river flow is heavy and attracts many adventure white water rafters. If the flow is reasonable in the months of July and August, then usually children starting between age 3-5 may go along with their parents. The trips can range from a few hours to a few days! Click here to learn more. This trail is a 1 mile hike that has a boardwalk through much of it. It is located 5.5 miles East of Lake McDonald Lodge and is a very popular hike. The cedar trees are magnificent and there are ferns and moss everywhere due to the humidity in this area of the park. The shallow water stream is fun to climb around fallen trees in with the kids too. Avalanche Gorge is a great halfway point through the looped hike. If you feel like your kids can make it further, at the gorge you can split off to continue your hike onto Avalanche Lake trail. It will be another 1.6 miles to Avalanche Lake. Is there a best time to visit Glacier National Park? It depends on what you are hoping to see and do! Some of the park doesn't open until late June or early July due to snow in the high mountains. However, if you want to enjoy rafting in fast moving water, you may benefit from visiting the Spring. Yet, wildfire season picks up in August and September so I’d advise staying far away from the area or you may have to deal with a lot of smoke. Therefore, the window to visit can be pretty short if you want to get it all in. 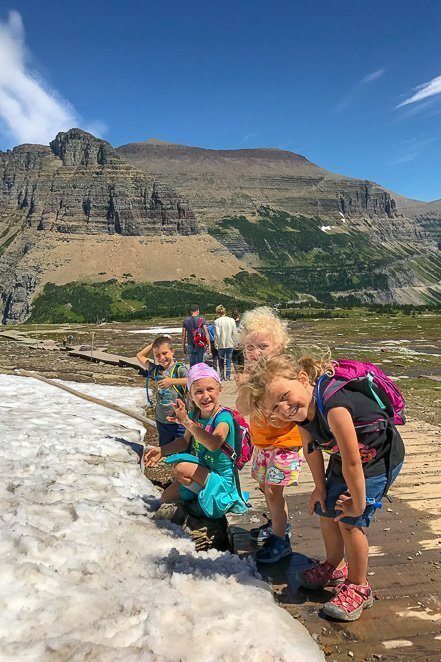 Better yet, plan to visit Glacier National Park with your kids again and get in what you missed the first time around. 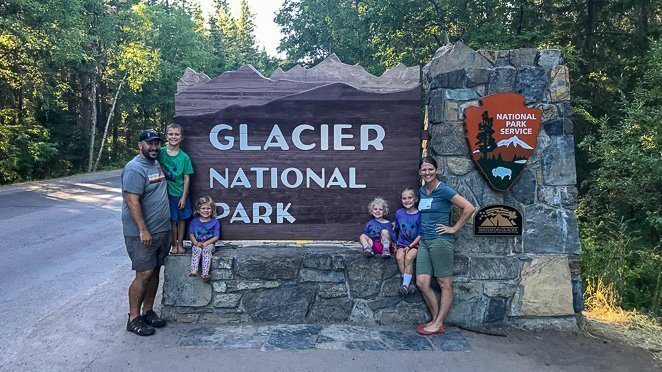 Our family spent over 2 weeks in July at Glacier National Parks we work as digital nomads and can work out of our RV. We were in awe by the beauty and excited for the fun Glacier National Park activities and views. Glacier National Park is a fantastic place to spend a family vacation! Plan to purchase bear spray and have it on your hip, always. Bring snacks everywhere to keep the kids happy and teach them how to pee in the woods. If you visit during the summer months, be aware that you are so far north the sun does not set until 10pm and rises at 5am! We were not prepared for this and didn’t realize how late it was while the kids were playing around the bonfire with friends until my littlest one became very cranky. That’s when I checked the time and realized it was 2 hours past her bedtime!! Bring your swimsuits and hiking shoes and be ready to make some fantastic family memories! 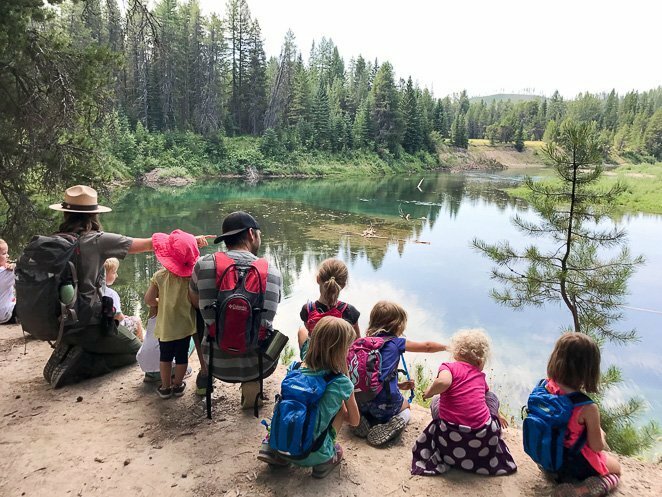 If you think you would enjoy Glacier National Park, then check out our post about the top 10 things to do with kids in Grand Teton National Park. The Grand Canyon is another excellent National Park to visit with kids while taking a family road trip out west. 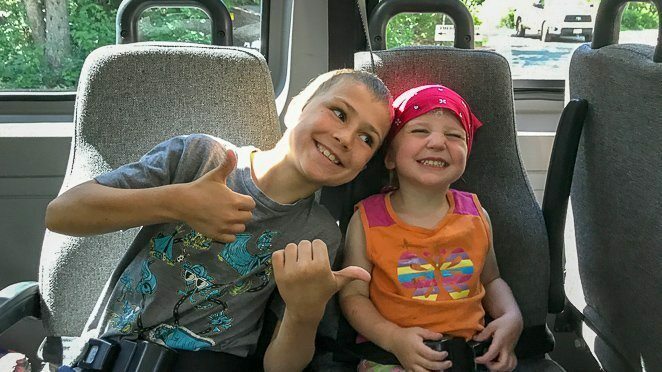 Previous Post 5 Tips To Full Time RVing With Kids Next Post Why Travel With Kids And You Should Too!